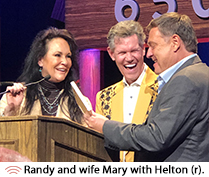 Country Aircheck and Country Countdown USA's Lon Helton was honored with the Bob Kingsley Living Legend Award last night (4/10) at the Grand Ole Opry House. Surrounded by 200 family members and friends, Helton's impact on country music was highlighted through in-person and video tributes, old photographs, reminiscing and performances from artists expressing their gratitude for the role Helton played in their lives and careers. Among the artists who performed were Dierks Bentley, Garth Brooks, Luke Bryan, Eli Young Band, Vince Gill, Randy Owen, Carly Pearce, Steve Wariner, Mark Wills, Trisha Yearwood and Chris Young, with Randy Travis making an appearance. Nowhere was Helton's influence on the country community more evident than through the speeches given by longtime friends and colleagues, including the award’s namesake, Westwood One's George Achaves, CA's Chuck Aly, Cumulus' Charlie Cook, CMA's Sarah Trahern, St. Jude's Teri Watson and the Opry's Sally Williams. The annual event benefits the Opry Trust Fund. Look for a full recap in Monday's (4/15) Country Aircheck Weekly. Reach Lon here.